This recipe is from fellow viewer Barbara Eversole. Thanks for this wonderful side dish! You can make Luby's Cafeteria famous mixed squash casserole at home. In a medium saucepan, bring about 4 cups water to a boil. Add carrots. Reduce heat, cover and simmer 6 minutes. Add squash, zucchini, and onion. Continue simmering uncovered 3-4 minutes or until carrots are tender-crisp. Drain and transfer to a large bowl. In a small bowl, whisk together soup, sour cream, salt, and pepper until well blended. Pour over vegetables and mix well. Transfer to a 2-quart baking dish. Cover with foil. Bake 30 minutes. In a medium bowl, combine cornbread and torn the white bread. Drizzle with butter. Toss lightly to coat evenly. Remove foil. Top vegetable mixture with cornbread mixture. Continue baking 5 minutes. 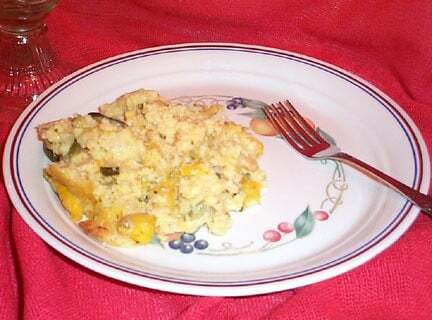 I like squash casserole I usually only use yellow squash this recipe will be a nice change.